Relax and unwind or dive in and have fun… the choice is all yours on an Easter break in Cornwall. Easter is a fantastic time to visit the county, with so much to see and do. Bring the kids and enjoy family fun and games on the beach or get busy at one of the many Easter-themed events taking place across the county. And there’s always a trip to one of the top family attractions, such as the Eden Project or Newquay Zoo, that you simply have to factor in! But if all that sounds like too much hard work, then why not simply sit back, relax and make the most of your surroundings? Enjoy the great outdoors with walks on the beach or the South West Coastal Path and drink in those amazing sea views. Or visit idyllic destinations, such as Padstow, Port Isaac, Fowey and St Ives, which are all only a short distance away. To make your holiday budget stretch even further we’ve got some last minute availability in our holiday homes, from 15th April. 7-night stays and short breaks are available – please call 01637 876431 or email here for details. Falmouth Spring Festival: 30th March – 17th April: A festival to celebrate Falmouth’s beautiful open and green spaces. With guided walks and talks, garden spring clean events, Gardeners’ Question Time and a Spring Fair. Cornwall Spring Flower Show: 1-2 April: A fragrant celebration of Cornish garden mania. Exuberant displays with camellias, daffodils, rhododendrons guaranteeing a colourful spectacle at the Boconnoc Estate. featuring show gardens, horticultural trade stands and competitive classes. Easter at the Eden Project: 1st to 17th April: Enjoy some crazy egg-themed games, including a new take on netball (‘nest-ball’ anyone? ), the tricky ‘pickled eggs’ (no eating involved! ), and a giant ‘egg-scramble’ course complete with ball-pool team challenge. Flambards Big Easter Egg Hunt: 16th April: Don’t miss Flambards’ BIG Easter Egg Hunt! Explore the theme park to see how many Easter eggs you can find and win a chocolatey treat from Flambards’ resident character, Ferdi the Fox. Art8 – Newquay Arts & Culture Festival – 27th April – 1st May: Art8 is Newquay’s Arts and Culture Festival – four days bursting at the seams with events, exhibits and workshops involving film, craft, spoken word, dance, photography, theatre, music, literature and more. Whatever time of year you choose to visit, you can be sure of a great range of self-catering accommodation. Why not choose a stay in our luxury holiday homes or glamping pods. We also have dozens of touring and camping pitches available! All our guests have access to our great on-site facilities and all at a great price! So, what are you waiting for? 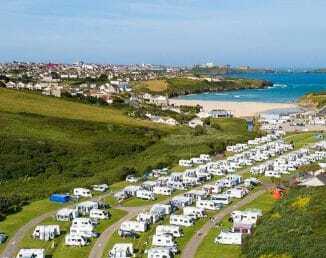 Call us today on 01637 876531 and book your Easter break in Cornwall today at Porth Beach Holiday Park!